This book easily lies flat on the stand and is clearly notated in the stylish jazz font that you expect from Kendor. An index shows that you’ll be playing a variety of blues, modal, AB, and AABA tunes in one to three flats, in swing, streetbeat, bossa/rock ballad, rock, latin, and double-time rock styles. The charts start at Grade 2, then process to some Grade 3 and 4. Each chart includes chord symbols so the user can enjoy improvising beyond the written notes, though this is not an improv-instructional text. The low range is almost exclusively in the staff, with rare exceptions; no trigger-notes are required. The Grade 2 charts top out at d1; Grade 3 and 4 charts reach a rare b-flat1. The melodies shift periodically between parts so everyone gets a chance to play the tune as well as counterpoint. While the $16.95 price may initially seem high for a 28-page book, it takes only a minute to download the 48 accompaniment mp3s (118MB) from a Kendor web page at no additional cost. This adds high value, as each of the 12 tunes receives four specific audio treatments: hearing both bones, only the second part, only the first part, and a rhythm section comping through the form four times. Trombonist Tom Garling lays down the demo parts with the piano, bass, and drums. 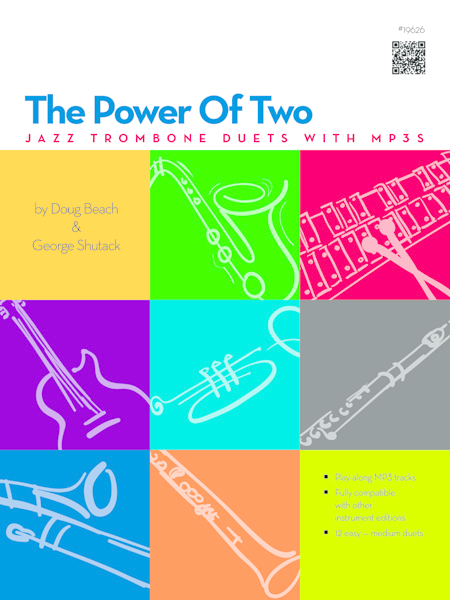 Beach and Shutack have created practical and valuable resources for jazz education for decades, and these duets are a welcome addition. This book is one of a collection, also available for flute, clarinet, alto/bari sax, tenor sax, trumpet, and guitar/vibes. They are fully interchangeable so you can mix or match your players within these duets, optionally using the recorded tracks as well. Thus it becomes the Power of Many!